As summer draws closer, we all need to make sure our kids are safe no matter what they’re doing. With that in mind, National Check Your Pool Gate Day is tomorrow, and a great chance to make sure your fence is up to scratch. Laurie Lawrence is the face behind the campaign. He’s a top athlete in his own right, is a former Australian Rugby Union Representative and Olympic and World Champion Swim coach. 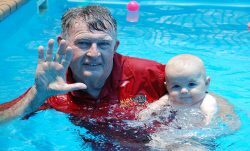 While this was his career beginning, Laurie is most proud of the legacy he is building for children’s water safety. Laurie joined Mel and Jeziel on Drive to discuss pool safety.